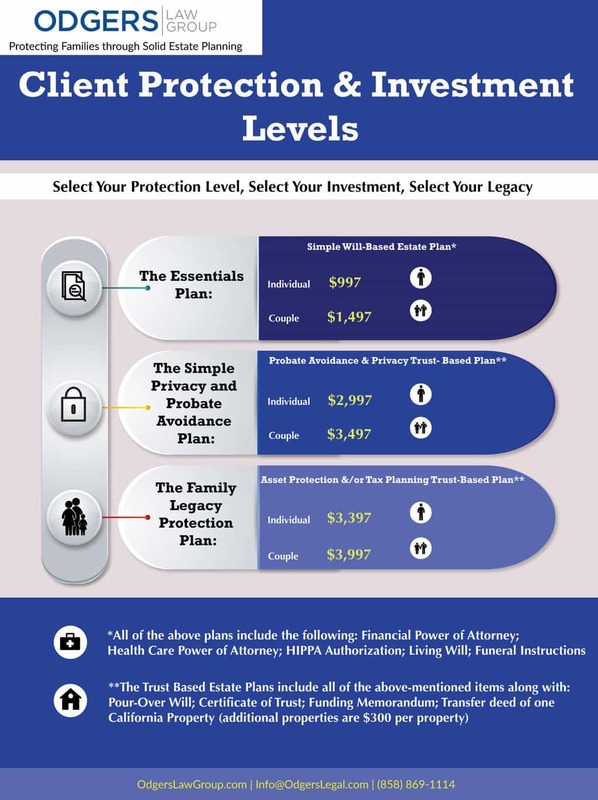 How much is Estate Planning? When it comes to billing for estate planning we believe in simplicity. We do not believe in the billable hour because it puts the client’s goals and the attorney’s interests at odds. Therefore, we work on flat rates and are happy to share our estate planning price list. Removing the mystery and anxiety of the billable hour allows clients to ask and receive answers to all of their questions. The fee that we quote includes all costs to finalize your estate plan. This includes the notary fees and filing fees to transfer your real estate into the name of the trust. The prices listed below are our base fees for the services provided. After we review your intake we will be able to give you a hard estimate of the total fee which will be based on the location and amount of real property that you own. How do you take Payments for Estate Planning? Generally, we require that half of the payment be made when you decide to hire us and sign our fee agreement. The other half is due on signing. We believe in the importance of estate planning. With that said, we will gladly work with anyone on setting up a payment plan for the cost of your estate plan if you currently are under financial hardship. Please contact us if you have any questions.